With the year 2013 virtually coming to a close, the time is ripe to analyze the trends in the coming year. The packaging industry in Indiais worth $24.6 billion with 22,000 firms comprising of raw material manufacturers, machinery suppliers, subsidiary material etc. The plastic packaging in India is growing at about 20-25%. 1) Focus on the shape and structure: The packaged good will always be recognized by the packaging style and in 2014, the shape, size and material that the product is packaged in will gain priority as each aspect can be an identifying tool for the brand. Packaging will need to reduce to smaller portions as the trend of customers buying those portions is gaining popularity. Hence, single serve or single use size packaging will be in trend in the New Year. Customers will lean more towards flexible packaging since it’s more convenient in terms of storage and takes up lesser space than other forms of packaging. The materials used in the manufacturing of the package are also going to be vital. The texture, opacity, the finish and finally the recyclability or the amount of recycled material that is used in the package will be a structural element which will be on top of the customer’s agenda. 2) Message on the package: Consumers today are bombarded with information and in such a scenario for your package to stand out amongst its competitors and to retain the consumer’s attention it is important that the message on your package is concise and clear. Basically, two fundamental questions: What are you- wherein the writing should clearly tell the customer about the packaged product. In case of any ambiguity, the packaging should make sure to clear the confusion. The second would be-what are you-the manufacturer can talk about the benefits of the product, its USP etc but care should be taken that there is no overdose of information. People today have no time to read and analyze overcrowded package. 3) Stand up pouches gain popularity- Stand up pouches are a favorites of customers in today’s age. A growing number of consumers favor the trend of stand up pouches. These pouches are cost saving, has a longer and improved shelf life, better barrier performance. Apart from that even for the manufacturer it’s a more economical option it decreases operating cost, increases output and offer greater flexibility in terms of shape and design. Stand up pouches are used extensively in FMCG produce. Stand up pouches is going to be one of the major gainers and trendsetters in 2014. 4) Green Packaging- Recyclable PET made from renewable sources will see a spurt in the coming year and the trend is here to stay. Due to the largely aware segment of consumers large industries have been investing heavily in development of environmentally friendly flexible packaging. Uflex Ltd., India’s largest flexible packaging manufacturer has made sincere efforts to reduce environmental impact of its products and the production process by manufacturing packages that are made out of use of green raw materials and are reprocess able thereby, minimizing emissions that may pose a threat to the environment. The Indian packaging scenario will witness more growth for flexible packaging owing to its cost-effectiveness and sustainability credentials. Be it in the West or in the East, the growth will be driven by a host of factors within the packaging and consumer retail sectors. Features like longer product shelf life, weight reduction and customer convenience are areas for packaging manufacturers to grow and innovate in. In today’s age consumer goods manufacturers face tough competition as they all struggle to find methods to lure the consumer towards their products. Money is spent on marketing, advertising, publicity etc. New methods are devised to make the consumer use/try their product. It’s not an easy task, since no matter what you manufacture there is already an existing competitor present in the market. In this time of cut throat competition, a number of manufacturers are turning to flexible packaging of their products. This form of packaging offers a variety of exciting marketing opportunities to the producer without increasing the cost of production. The packaging can be tailored to suit the merchandising requirements. The 3D / 4D stand up pouches are a popular style of packaging. It is made by blending several layers of plastic with aluminum. This combination allows for a new and sophisticated printing and designing techniques to be used on the packet. This fact alone gives the manufacturers to design attractive logos, designs, graphics etc on their package which can catch the eye of the consumer. Flexible style of packaging can be customized into practically any shape or size. They can also incorporate a variety of colors and styles. A different looking packet is bound to attract the eye of the consumer. Flexible packaging allows the usage of same style of pouches to store different items. For instance the basic pouch can be used to store food, beverage and non-food items. With the addition of a special feature the pouch can be even more customized. For e.g., if a spout is added to the basic pouch it can be used to store liquids. The addition of a zipper and diaphragm will make the pouch more convenient to store and restore dry items. Flexible packaging helps businesses and brands gain recognizition. The process is cheap so even the most cost conscious business can afford it. It can be customized to suit a brand so that businesses don’t have to end up choosing between short term gains and long term recognizition. Uflex believes that the greatest improvement in the packaging industry is the flexible packaging. Many of the innovations that have become a part of the FMCG industry are products of the flexible packaging industry. 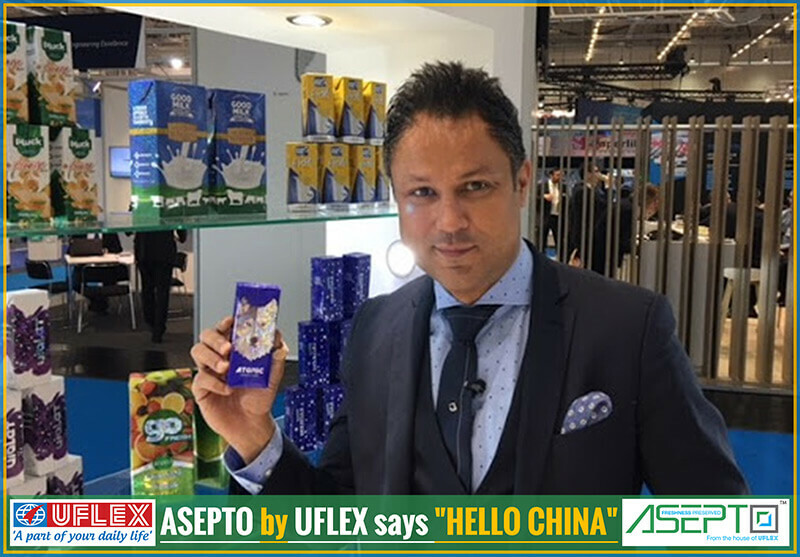 Uflex pushes for new innovations and trends thanks to the breakthroughs in plastic research and raw material enhancements. Green is the new buzzword within the packaging industry. Sustainable ideas and environmental friendly packaging is at the helm of innovation for the flexible packaging companies all over the world. The ecological impact and effect on environment by various packaging solutions is the significant force at present. The mantra is the 3 Rs which can help save our environment is Reduce, Reuse, Recycle. The latest technologies helps the manufacturers to engineer and produce packaging that is simple to use, is eco-friendly and also creates an appeal amongst the consumers. Flexible packaging today offers a variety of packaging options that has shrink sleeves, resealable option, rise up plastic packages, zip pouches, stand up pouches etc. These help the food take the shape of the package and preserve the content for a longer shelf life. The quality of lamination also helps preserve the food and its taste for a longer period. Flexible packaging is a sustainable packaging solution as it makes less use of resources and materials. There is less wastage and less use of energy and water at the manufacturing level. There are diverse packaging systems for different kinds of products. The manufacturers adopt them in order to satisfy the requirements and in accordance to the taste of the consumers. In this blog we look at the sustainable benefits offered by Foil packaging and stand up pouches. Foil packaging is additionally being adopted by a number of snack manufacturing units as it releases less amount of plastic harm to the atmosphere. The bag has the power to sustain shock, squeeze, temperature changes and it doesn’t have any negative impact on the human body. Many manufacturers opt for vacuum packaging along with foil package. This allows the food to be free from contamination and the foil ensures that the packaged product stays fresh throughout its intended shelf life. It also saves up on space as compared to more traditional methods of packaging. A stand up pouch is another option in flexible packaging as an eco friendly alternative to other forms of packaging especially for liquid products. It is a more sustainable option as compared to more traditional forms of rigid packaging like bottles, cans, jars etc which are used to packing liquid products, baby food, cereal etc. Stand up pouches use less space which means less transportation and storage cost. The chances of spillage etc are also lessened considerably. Many pouches come with resealable options like screw on caps which make the product more convenient and sustainable. Spouted pouches are a popular choice among the consumers, manufacturers, and retailers due to their ability to inhibit harmful impact on the environment, their ease of use, inexpensive nature, and flexible packaging options. Uflex has always been committed towards sustainable options of flexible packaging. Being on the edge of innovation we provide packaging that keeps the products safe, fresh and devoid of any harmful reactions. With our constant R&D for safer and environment friendly packaging, we are dedicated to bringing safer, better and sustainable packaging solutions. Last year had been a good one for the global flexible packaging industry. Emerging markets in Asia and Latin America led to a strong resurgence after the global recession, and it is projected that flexible packaging will be a $100 billion industry by 2016. This year, packaging industry players are looking forward to new efficiencies and economies of structure. Reorganizations, consolidations, lean manufacturing and sustainability are some of the measures they consider to tackle the current situation. Apart from this, flexible packaging industry is heavily relying on other areas such as performance metrics and looking more stringently at project proposals. Smart Packaging: With changing lifestyles and consumers being more demanding, active and intelligent packaging focus more on consumer benefits such as food quality and safety, freshness and information rather than specific retailer and manufacturer driven benefits. Bio-Based Plastics: Recyclable PET made from renewable resource is projected to offer significant growth potential in long term. Hence the corporations involved in the soft drink industry, are investing heavily in the development of this material. Stand-up Pouches: Bottles and cans have become the things of past. Stand-up pouches are preferred more because of their flexibility, sustainability and convenience. They are one of the most innovative marketing approaches to stimulate the sales of a stagnant brand. Retail Ready Packaging (RRP), a method of packaging to make the products easier for the retailers to stock, continues to gain traction in North America more and more retailers have started to consider implementation, and others broaden the scope of existing initiatives into additional categories. Social Media’s Role in Packaging: Marketing strategies are changing and internet continues to revolutionize how we find, buy, sell, and interact with brands and their products or services. While traditional marketing focused on pushing messages out, nowadays, it’s more about getting found by customers. Hence, market players need to provide value and earning customer loyalty instead of simply conveying message to the consumers and hoping it will stick. Along with this, packaging industry professionals must not ignore the consumer voice. Studying consumer culture will always reveal packaging trends and labeling needs in future. Considering the lifestyle changes and economic growth, Uflex Ltd. always follows a strategy with innovation, proximity to customers to provide better services and quick deliveries and focus on operational excellence.